Indoor/ outdoor wall ceiling mount is compatible with Arlo and Arlo Pro smart home security camera system as well as other compatible cameras (security camera is not included). With white color, the camera mount is made of sturdy metal and ABS material which can last for a long time; Oxidation resistance. They work well for the cameras with weight they can withstand. It supports up to 5 lbs of weight. Not only good for Arlo camera, but also for CCTV or DVR or others camera with same interface. Compatible models: Arlo, Arlo Pro, AngelCare baby monitor, CCTV camera, video security camera, camera ML-500, etc. Camera wall mount can be installed easily; These are more secure because they go into the threaded mount on the bottom of the cameras. With 360 degree swivel and 90 degree tilt, you can use it to mount the camera on the wall and ceiling, adjusting to the appropriate angle you want. 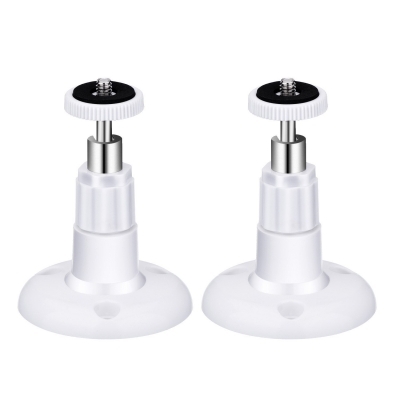 The camera mount height is 9.6 cm, the diameter of the bottom is 6.8 cm, the top screw diameter is 0.5 cm, the hole diameter for the mount screw is 0.4 cm.